The United States dollar, or the American dollar, is the official currency, or money, of the United States of America and is also used in a number of other countries outside the US. it is also the standard currency for international markets selling goods such as gold and oil (petrol). When writing, the symbol for the American dollar is the dollar sign ($). Dollars can also be known as USD (U.S. Dollar). 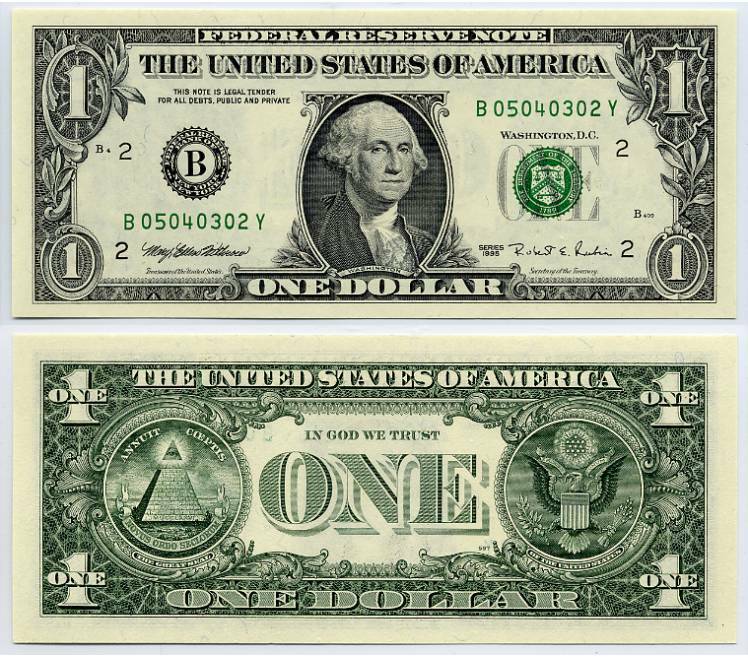 The American one dollar bill has a picture of George Washington. There are currently paper bills (currency) of 1, 2, 5, 10, 20, 50, and 100 dollars. All U.S. dollar currency has been the same size since 1928, unlike some countries where bank notes, or pieces of paper money, with different values have different sizes. The U.S. also has dollar coins. Some are silver colored and some are gold colored. Vending machines often give dollar coins as change, since it is easier for the machines to give out coins than paper money. Some of the more advanced vending machines give out paper money as change. Paper dollars are much more common than dollar coins.